Eric Hobsbawm is Britain’s most distinguished living radical historian, and part of his life’s work has been a global history in four volumes, from 1789 to 1991. The last of these, The Age of Extremes, was published in 1994, in the aftermath of the end of the Cold War. 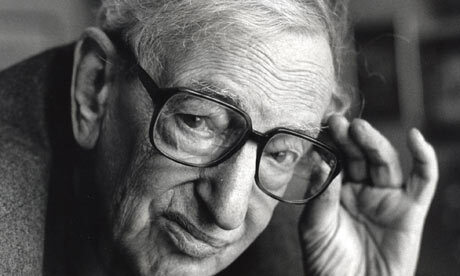 The latest edition of New Left Review, which marks the journal’s 50th anniversary, opens a long and reflective interview (subscription required) with Hobsbawm by asking what’s changed since 1991. Some of these points are obvious, some less so. Together, they add up to a picture of significant fragmentation, both at a global level and within states. “The shift of the economic centre of the world from the North Atlantic to South and East Asia. This was beginning in Japan in the seventies and eighties, but the rise of China from the nineties has made a real difference. “Secondly, of course, the worldwide crisis of capitalism, which we had been predicting, but which nevertheless took a long time to occur. “Third, the clamorous failure of the US attempt at a solo world hegemony after 2001—and it has very visibly failed. “Fourth, the emergence of the new bloc of developing countries as a political entity—the BRICs—had not taken place when I wrote Age of Extremes. He started badly. If you compare the first hundred days of Roosevelt with the first hundred days of Obama, what leaps out is Roosevelt’s readiness to take on unofficial advisers, to try something new, compared to Obama’s insistence on staying right in the centre. I think he’s blown his chance. His real opportunity was in the first three months, when the other side was totally demoralized, and before it was able to remobilize in Congress—and he didn’t do it.